(CNN) -- A Holocaust denier Pope Benedict XVI welcomed back into the Roman Catholic Church last month has been removed from his position as head of a seminary in Argentina. Bishop Richard Williamson, shown in a recent Swedish interview, says he'll recant "if I find this proof." The views of Bishop Richard Williamson, who has led the seminary in La Reja since 2003, do not reflect those of The Society of St. Pius X, said Christian Bouchacourt, head of its Latin American chapter. "It's obvious that a Catholic bishop cannot talk with the ecclesiastical authority, but to things related to faith and morality," Bouchacourt said in a written statement. Williamson, shortly before the pope lifted his excommunication, denied the Nazis had systematically murdered 6 million Jews during World War II. In his blog Saturday, Williamson, referring to himself, posted a note, saying, "His Excellency is neither dead, dying, nor retired." Earlier Sunday, German Chancellor Angela Merkel phoned Pope Benedict about the issue, though neither side seemed to have shifted its position over Williamson. "It was a very constructive conversation," the German government and the Vatican said in a joint statement about the call. Merkel and the pope expressed respect for each other's opinion, the release said -- diplomatic-speak for saying neither side budged. Merkel demanded Tuesday that the pope firmly reject Holocaust denial. "The pope and the Vatican must make absolutely clear that there can be no denial of the Holocaust," Merkel said. The Vatican has pointed to several statements by Pope Benedict in the past few years condemning the destruction of European Jewry, including his visits to concentration camps. He has also said he did not know of Williamson's views on the Holocaust when he lifted the excommunication. "I believe that the historical evidence is strongly against -- is hugely against -- 6 million Jews having been deliberately gassed in gas chambers as a deliberate policy of Adolf Hitler," Williamson said recently in an interview with a Swedish television station, which also appeared on various Web sites after its broadcast. "I believe there were no gas chambers." Germany's Catholic bishops Saturday called for the expulsion of Williamson, a member of an ultra-conservative group expelled from the Church by Pope John Paul II in 1988. "Mr. Williamson is impossible and irresponsible," Archbishop Robert Zollitsch, chairman of the German Bishops' Conference, said Saturday, according to Spiegel Online. "I now see no room for him in the Catholic church." In the Saturday article, Spiegel quotes Williamson saying he will not recant and that he would need more evidence to believe the Holocaust really happened. "If I find this proof, then I will correct myself," he said. "But that will require some time." On Wednesday, the Vatican had ordered Williamson to "distance himself" from his views "in an absolutely unequivocal and public manner." 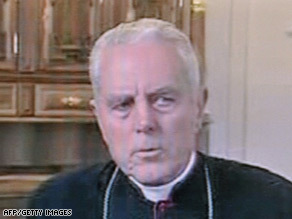 The Vatican's secretary of state, Cardinal Tarcisio Bertone, said Williamson will not be allowed to perform priestly functions if he does not recant. He said the pope was unaware of the comments when he rehabilitated Williamson and three other members of the Society of Saint Pius X.
Williamson apologized last week for the "distress" he has caused the pope, but did not retract his comments. Williamson, who now lives in Argentina, and three other bishops who belong to the Society of Saint Pius X were excommunicated 20 years ago. The society was founded by Archbishop Marcel Lefebvre, who rebelled against the Vatican's modernizing reforms in the 1960s, and who consecrated the men in unsanctioned ceremonies. Williamson's reinstatement and comments have been fiercely criticized by Israel, American Jewish groups and political leaders. The pope -- who was born in Germany and was a child during the Nazi era -- rejected Holocaust denial in public statements on January 28. At the end of his weekly audience, the pope discussed his trips to the former concentration camp at Auschwitz and the images of "the heinous slaughter of millions of Jews, the innocent victims of a blind racial and religious hatred." His spokesman, Father Federico Lombardi, called Williamson's remarks to Swedish television "absolutely indefensible." Journalist Brian Byrnes in Buenos Aires, Argentina, contributed to this report.